In November 2009 Peru joined the Hague Convention eliminating the need for consular and embassy stamp on foreign public documents, accepting now apostilles as a form of international legalization of documents. If you’ve made the decision to go to this country for an extended period of time and it is time to start packing the bags. We are all faced with tough decisions when we reach this point: What do I need to bring from home? What can be bought in there? What will be taxed in customs? What are the document requirements for my visa?. What you decide to bring with you can be one of the most important aspects of your move and your time in this beautiful country. If you arrive to find that you left something you need behind, it may be costly or nearly impossible to get that item over there. On the other side of the coin, no one wants to arrive and find that they have brought things all the way from home that can easily be bought here. 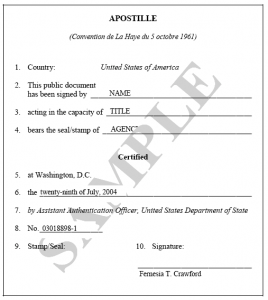 The decision to join the Apostille Section of the Hague Convention simplifies all procedures in which foreign documents are presented for personal and business reasons such as school and university diplomas, powers of attorney, birth certificates, corporate documents, etc.